URI Beaupre Center for Chemistry — The Green Engineer, Inc. 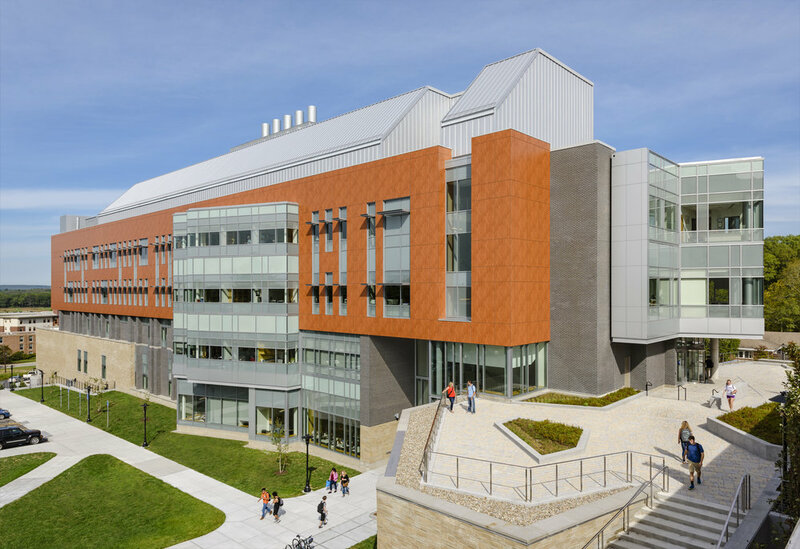 The new Beaupre Center for Chemical & Forensic Sciences at the University of Rhode Island (URI) completes the Health & Life Science District on the northern sector of URI’s Kingston campus. University President Dr. David M. Dooley - a chemist and active researcher - saw chemistry research and teaching as vital to the URI curriculum and to the State's economy. The new four-story building has triple the amount of space for teaching labs and nearly double the space for research labs as Pastore Hall, the former home to Chemistry. The Center’s state-of-the-art capabilities will allow faculty to compete more effectively for research grants, and to rapidly move scientific discoveries into the marketplace. The Center will serve more than 7,000 students that take chemistry each year. A primary at-grade path serves the lower lobby, general chemistry laboratories, lecture halls, study room and administrative offices. An upper pedestrian path traverses a new outdoor terrace and provides access at level 2 to the double-height upper lobby, organic chemistry teaching laboratories, an instrumentation lab, classroom and departmental offices. Both levels 3 and 4 feature research labs, administrative and faculty support spaces. The Center’s design expresses the dynamic academic environment within, comprising two floors of research sitting atop a teaching ‘base’. The building features robust capabilities, serving 178 fume hoods evenly split between teaching and research programs. 164,000 CFM of air is distributed from the penthouse through the labs and back to heat recovery units in the penthouse. The design organizes MEP services in five vertical shafts placed at intervals to ensure each lab is a short distance from services. For future flexibility, plumbing valves are easily accessible and located in closets adjacent to each lab. The project set significant sustainability goals. To meet the challenge, the design includes many water and energy reduction strategies, including low-flow plumbing fixtures, water efficient landscaping, on-site water storage (a rain garden and cistern), high efficiency fume hoods, energy recovery AHUs, façade/building envelope optimization, innovative heat exchangers to harvest energy from water cooled equipment, and a continuous air monitoring system (Aircuity). The overall annual potable water use consumption is reduced by 35%. The project’s predicted Energy Use Intensity (pEUI) is 202 kBtu/sf/yr, compared to a “Regional Average EUI” for similar laboratory buildings of 397 kBtu/sf/yr. In layman’s terms, this building uses approximately half (51%) of the energy that similar laboratories in the region use. In LEED EAc1 “Optimize Energy Performance” terms, the project is 24% more efficient than “code minimum”.